I am not a patient person. I hate waiting. I hate the wasted time involved in running errands. Relaxing is not a skill I desire nor one which I posses. Patience is no virtue. And whoever said that was a bold-faced lier. So, as you can imagine, being on sabbatical presents some challenges. I joke as B goes out in the morning that today will be the day that I tear down that wall between the office and living room. And I am only sort of joking. (A secret? I found a sledge hammer in our shed). Last sabbatical I tried to stave off boredom by learning to make pies. Believe me, home renos will be welcome after that debacle. So lots of stuff happens before Prospero and Miranda get to the island. And by the end of the play, we expect that lots will happen when they all return to Milan and Naples. But most of the “activity” that occurs through the course of the play is the work of illusion, tricks of magic that allow Prospero to remind his enemies of the crimes they have committed, so that might feel remorse, and he might, ultimately forgive them. Thus, the storm or the tempest does not really occur, and everyone aboard the ship and the ship itself is left untouched; Alonso, who believes his son died on the ship, grieves for naught, for we know he is safe with Prospero and Miranda; even the plot between Sebastian, Alonso’s brother, and Antonio, to kill Alonso comes to nothing. So in terms of action – the kind of stuff that keeps me relatively calm and balanced – not much of it occurs. 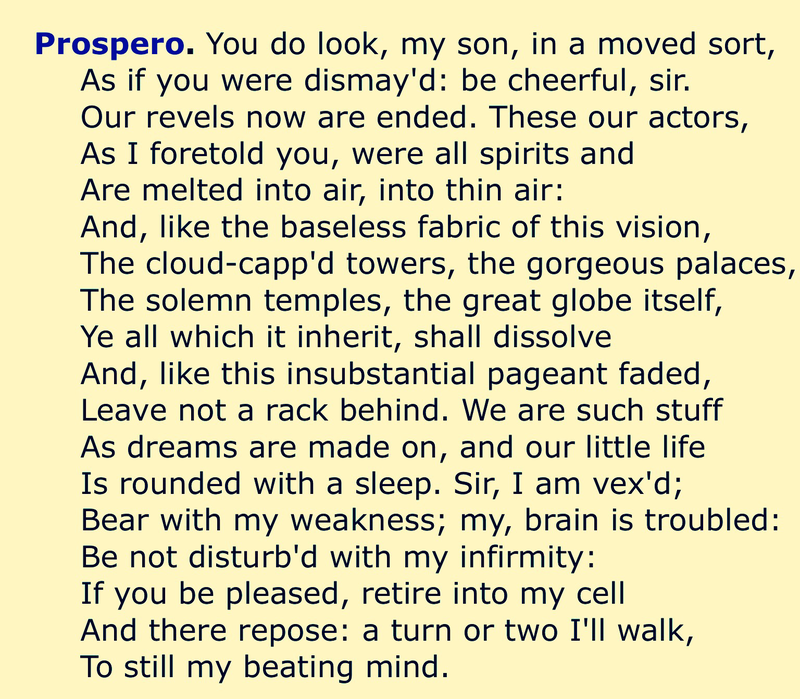 Towards the end of the play, Prospero, speaking to Ferdinand, addresses this point in what are perhaps the most beautiful, if difficult, lines of the play. Prospero suggests that the world we live in is akin to the illusions he makes – insubstantial and baseless. And that our lives are but dreams. Now, if you are me, this is not an easy sentiment. After all, it seems to mean that all of my projects, all of the stuff that I spend an inordinate amount of time and energy on, are lacking in substance an reality. I am busying myself with mere illusion. But to say that there is no real activity in the play is not the same as saying that nothing real happens. For several important things occur, even if they are not the stuff of an action film. For instance, while the romance between Miranda and Ferdinand is contrived by Prospero, they nonetheless fall in love. And the many villains of the play (with the exception perhaps of Antonio and Sebastian) are brought to regret their crimes and seek to be reconciled to those they have harmed. Finally, Prospero, moved perhaps by the image of love he sees between Miranda and Ferdinand, responds with love in kind, forgiving his enemies rather than wreaking vengeance on them. While the external activity of the play is based in illusions, the internal activity and movement of the characters is very real. While ships are not wrecked and harpies don’t truly descend, the contrition, forgiveness and love that occurs in the play are nonetheless true. Dante’s Inferno begins with a beautiful image. Having woken up in a dark wood, Dante is terrified, but his fear subsidies when he sees a mountain girdled in sunlight. All he has to do is climb the mountain and he will be able to see his path home. Dante writes that upon seeing the mountain, “the fear that had endured in the lake of [his] heart … was calmed”(I, i, 19-21). This, however, is only a momentary reprieve for Dante, as he is unable at this point to climb the mountain and must take a much more difficult route through Inferno. Of course, we don’t actually think that Dante descends into Inferno. Instead, we understand that the journey takes is through the lake of his heart. He must turn inward and confront the kind of person he has become, take stock of his crimes and seek instead to love and be loved in turn. We know that the tempest that begins Shakespeare’s play is just an illusion, one that Prospero creates so as to manipulate his enemies. And yet, the tempest itself is real. It exists in the heart of each character. Like Dante, they must each confront the lake of their heart. As I tap, though, on the wall that separates the living room and office, it seems pretty substantial. And I expect whacking it with a sledge hammer will feel pretty satisfying. So what are we to make of the finite order and the “illusions” that permeate all aspects of our lives? At the end of the play, Prospero gives up his magic, he will no longer busy himself with illusions, but rather, we anticipate, as he nears his death, he will focus on the reality that exists somewhere beyond the finite order, hoping for forgiveness and love. And yet, the illusions he created are the means by which he was reconciled to his enemies and his daughter was brought to love. These illusions led to reality and truth. The world might be ever changing and nothing in might avoid undergoing transformation and destruction, yet, for Prospero, the illusions of this world reveal the reality that lies behind it.
. . . this world of fact we love/ Is unsubstantial stuff:/ All the rest is silence/ On the other side of the wall;/ and in the silence ripeness,/ And the ripeness all. Without, in short, our devoted pungent expression of the partial and contrasted, the Whole would have no important and its Day and Night no interest.